Country style isn’t just an aesthetic—it’s an ethos, a route back to nature and simpler living. Get inspired to leave the city behind with these five gorgeous rustic homes, complete with spacious lots, exposed beams, generous wood-burning fireplaces, and plenty of room for daydreaming under starry skies. 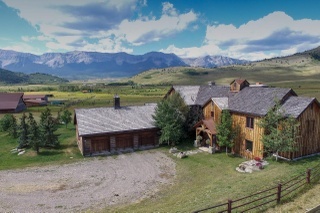 Set on nearly 3,000 acres of land in the Alberta foothills west of Lethbridge, the one-of-a-kind Willow Valley Ranch is the pinnacle of country living. 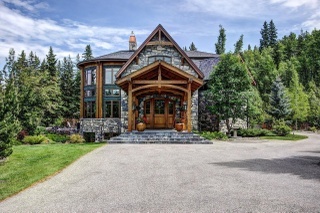 The 5,500-square-foot main house features plenty of wood and stone, an enormous rough-hewn hearth in the great room, and beautiful exposed beams throughout. Watch the sun rise over the neighbouring hills through the double-storey windows, ride out across the meadows and through the woods, or fish in the stocked pond. Additional structures include a barn, workshop, cattle shed, pump house, and BBQ facility, plus a second ranch with a bungalow, barn, and shed. 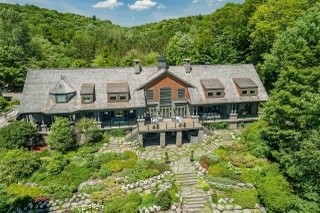 No need to search your imagination to plan your dream home—the designers of this stunning 18,000-square-foot Muskoka residence already did. The list of amenities is nearly endless: for relaxation, enjoy the sandy beach, private bar, games arcade, movie theatre, hotel-grade sauna, and yoga studio. For recreation, head to your own fitness centre, art studio, tennis court, sports field, and private winter ski hill and snowboard park. The home’s tastefully-styled interior features 35-foot vaulted ceilings, stone fireplaces, and reclaimed timbers salvaged from a 19th-century Lake Huron shipwreck, meaning that whether you’re inside or out, the view is sure to be extraordinary. Elevated Lodge on Shuswap Lake, B.C. Opt to live the simpler life at this spacious custom-built lakefront home on B.C.’s scenic Shuswap Lake. 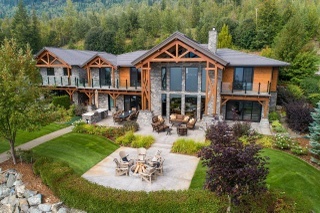 The nearly-6,000-square-foot house is built in the classic West Coast style, with a stone-clad exterior, towering timber columns and beams, and a gorgeous view of the water. In warm weather, spend your days on the lake, the tennis court, or an Adirondack chair on one of the property’s appealing outdoor seating areas. On cooler days, the indoors beckons: keep active in the games room, complete with pool table and fitness centre, or read by the large wood-burning fireplace with a glass of one of the region’s boutique reds, the lake always in sight. Live the dream of getting away from it all in this Scandinavian-inspired log cabin on over 14 acres in rural Québec. The cathedral ceilings, exposed beams, and oversized windows are sure to enchant, and the heated pool, riverside sauna, and scenic views guarantee complete relaxation. 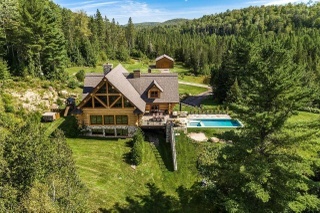 Rustic in this case certainly doesn’t denote a lack of amenities: enjoy the professional-grade appliances, gym, wine cellar, and golf simulator as you retreat to the striking wilderness of Québec’s Laurentides. West Coast design meets the Alberta hills at this Arts-and-Crafts–style home in Calgary. Just 20 minutes from downtown, this 4,200-square-foot home rests on nearly an acre of parkland, so you can enjoy all the conveniences of the city but in a beautiful country setting. Book at tee time at the neighbouring Valley Ridge golf course, relax by the covered fire pit or in the hot tub, catch up on your reading in the cozy library, try your hand at billiards in the games room, or mix up a drink at the wet bar. Whether you’re dreaming of a secluded luxury ranch miles away from everything or a house in the city with a little cabin charm, a home with exposed beams can bring a sense of presence and history to your days. Cook family meals, plan a lavish gathering, or enjoy a solitary retreat with evidence of the forest overhead. Find the country home of your dreams in Canada’s rugged landscapes, and let the rustling trees and pristine waters call you back time and time again.